In this lesson, we will learn how to estimate and measure units of capacity in the metric system and solve word problems in a real-life context. The litre is a unit for measuring what? Complete the following: The amount that a container holds is its . Karim is trying to drink 1.8 litres of water every day. 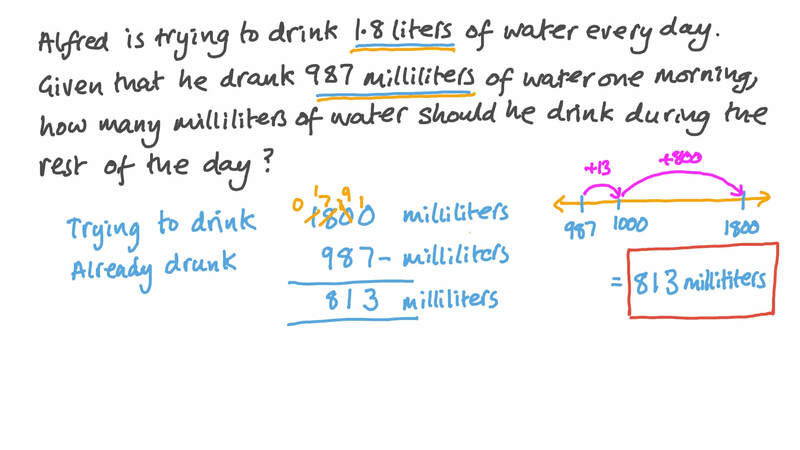 Given that Karim drank 987 millilitres of water one morning, how many millilitres of water should he drink during the rest of the day. A group of elephants drink 982 liters of water each day. How many days will 4 910 liters of water last? Choose the most appropriate unit to measure the capacity of a bucket in order to avoid very large numbers or small decimals. Choose the most appropriate unit to measure the capacity of a wading pool in order to avoid very large numbers or small decimals. Choose the most appropriate unit to measure the capacity of a spoon in order to avoid very large numbers or small decimals. Choose the most appropriate unit to measure the capacity of a juice box in order to avoid very large numbers or small decimals. Choose the most appropriate unit to measure the capacity of a barrel of water in order to avoid very large numbers or small decimals. Choose the most appropriate unit to measure the capacity of a bottle of glue, in order to avoid very large numbers or small decimals. 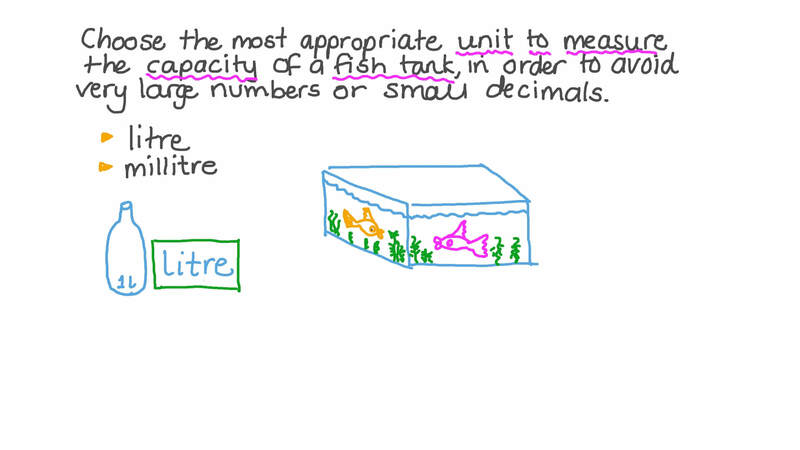 Choose the most appropriate unit to measure the capacity of a fish tank, in order to avoid very large numbers or small decimals. A baby animal drinks 279 litres of milk each day. Is 279 000 mL of milk enough to feed the baby animal for one day? Calculate the capacity of a swimming pool having a length of 23 units, a width of 7 units, and a depth of 12 units. A cuboid-shaped swimming pool has internal dimensions of 41 m, 27 m, and 2.7 m. Find its capacity in litres. A plastic box has a total volume of 912 cm3, and a capacity of 695 cm3. What is the volume of the plastic? What is measured in cubic centimetres? What is the most suitable unit for estimating the volume of a room? Choose the most appropriate unit to measure the capacity of a pot of soup in order to avoid very large numbers or small decimals. Cooking oil comes in 1.5-litre bottles and 1 537-millilitre bottles. Which is larger, the first or the second bottle?